Nearly 100 Austin residents, organizers and police officials came together earlier this week to discuss how to bridge the divide between the community and police. 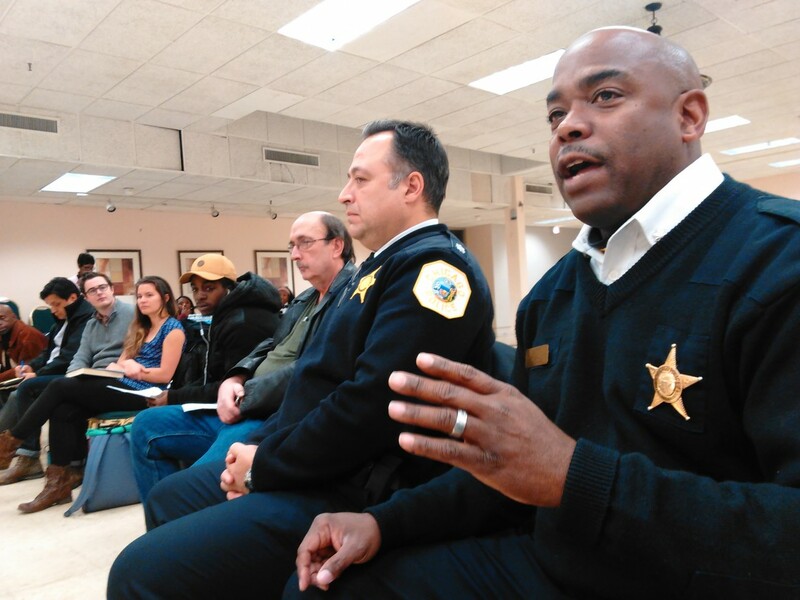 Hosted by Fathers Who Care, a West Side nonprofit based in West Garfield Park, Monday’s gathering focused on solutions to the problem. Some residents, like Barbara Butler, also came seeking help. Butler said her Austin home has been shot up four times since the start of 2017. In fact, shootings on her 4800 block of Cicero are constant, said the 43-year Austin resident. Her mom takes to the floor when they here shots fired, Butler said, adding that she’s counted at least 12 bullet holes on the family home. Butler said her block needs a greater police presence. “I don’t want to see a [police] car just drive by the crowd and keep going. When I call the police, I’m looking for you to get out and say something,” she said of her block, which has its share of people causing trouble in the area. Some of the other 60 or so residents at Monday’s meeting agreed that more police are needed throughout the community. Rev. Walter Jones, founder and executive director of Fathers Who Care, encouraged folk to offer solutions. Commander Dwayne Betts of Austin’s 15th Police District said the community and police need to get to know one another better. 25th District Commander Anthony Escamilla said his district tries to engage the community on a “human” level. Bringing youth and officers together for programs like basketball are among his district’s many strategies to accomplish that, Escamilla said. “Putting a name with the faces of the officers and a name with the people in the community just brings the people together with us,” Escamilla said. That effort, however, needs to start with the beat officers who patrol the streets, added Clifton “Booney” McFowler of Austin’s BUILD Chicago, an anti-gang intervention organization. The former gang member and ex-offender said he’s too often mistaken for a criminal by police while organizing in the community. Other residents agreed that more more interaction is needed. But they also encouraged neighbors to reach out to the police, especially when crimes are committed by folk in the community. Some in the neighborhood know who’s behind these crimes but won’t say anything, fearing retaliation from the perpetrators, the residents said. Some residents said neighbors need to walk the beat with officers – and even invite them into their homes to get the know each other. Longtime resident Carl Ellis, a member of the Westside Branch of the NAACP, said city services other than police are needed to protect the community. The "meet and greet" with Anthony J. Escamilla will be from 6 to 7 p.m. Jan. 29th at 5555 W. Grand.